Congratulations Adrien Allaine! Farewell APT Macau! Congratulations to 23 year-old Frenchman Adrien Allain who is the toast of Macau this evening as he walks away with $391,556 in prize money and the title of 2009 APT Macau champion. We started with 326 hopefuls in another great show of support for poker in Asia, as the strong local contingent was joined by a throng of pros from all around the world. Allain proved himself a tough competitor as he rose through the field on Day 2 to be well placed entering this final table. From there it was virtually one-way traffic, which is very impressive considering the credentials of some of his opponents such as Casey Kastle, David Steicke and Poker Pack Pro J.C. Tran. His tournament is all the more impressive after we discovered that Allain qualified for this event through a $5 online satellite. After the champagne bottles were popped and the trophy raised, APT CEO Chris Parker posed the question, "So, how are you feeling now?" The response was an unexpected, "I don't speak English" from Allain. "That's ok," responded Parker, "I'll make it up for you...he feels great!" The music is pumping, the bubbles are flowing and the APT models are mingling as the French are celebrating a famous victory. Thanks to the APT for another memorable tournament both on and off the felt, and thanks for following our coverage over the past few days. Our next stop is across the road at the Grand Lisboa Casino in Macau for the PokerStars.net APPT Macau Main Event which kicks off on Tuesday, We look forward to your company once again! Inwook Choi Eliminated in 2nd Place ($214,158); Adrien Allain Wins APT Macau Main Event ($391,556)! It's all over. A series of quick raises before the flop between Inwook Choi and Adrien Allain resulted in all of the chips being in the middle. Choi was the player at risk of elimination and also the player with the best hand. It wasn't to be for Choi. The flop came to make a pair of treys for Allain. The on the turn left Choi drawing very thin. He was out when another jack hit the river. Choi leaves in second place with $214,158, a result that is no doubt disappointing but an excellent accomplishment nonetheless. Adrien Allain raised to 50,000 and Inwook Choi called in the big blind. The flop arrived and both players quickly checked. The turn was the and Choi fired out 65,000 with Allain making the call. The river delivered the and again it was checked. 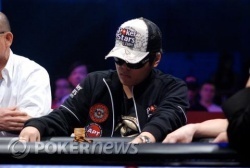 Choi showed for a flopped flush draw that rivered a pair to be too good for Allain's . Inwook Choi may be getting his sea legs. He opened for 50,000 and was called by Adrien Allain. 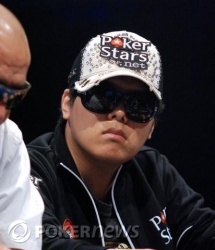 Allain check-called 65,000 on a flop of but gave up when Inwook Choi bet 145,000 on the turn. Adrien Allain raised to 50,000 on the button before Inwook Choi popped it up to 150,000 from the big blind. In the first real signs of preflop aggression heads up, Allain paused for a moment before making the call. Choi fired a bet of 200,000 on the flop of and took down the pot. Heads-up play starts where final table play left off for Adrien Allain. He's running great. He opened to 50,000 and was called by Inwook Choi. on a flop of , both players checked. The turn was the and bought a bet of 65,000 from Choi. Allain raised that bet to 140,000. Troy called. Both players checked the river. Choi showed down for a straight draw and a flush draw, both of which missed; Allain was much better with . Inwook Choi raised the button to 50,000 and Adrien Allain called in the big blind. The flop came down and both players checked. The turn was the and Allain fired 50,000. Choi made the call. The river brought the and both checked it down. 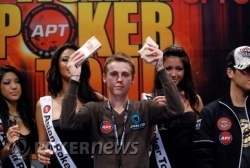 Allain tabled which was the best hand as he collected the pot. After passing the blinds and antes back and forth for a few hands, we finally saw a flop. Inwook Choi raised to 50,000 and Adrien Allaine called. They checked the flop and the turn. When the river fell , Allain took down the pot with a bet of 70,000. After our two players were re-introduced to the audience and the lovely APT models brought the prize money to the table amongst the usual APT lights, glitz and glamor, the players have taken their seats once again. Adrien Allain has a 2-to-1 chip advantage as the cards are back in the air with the trophy on the line!